The Global Volcanism Program has no activity reports for Meru. The Global Volcanism Program has no Weekly Reports available for Meru. The Global Volcanism Program has no Bulletin Reports available for Meru. Seen from the west, Meru has a conical profile but it contains a 5-km-wide breached caldera on the E side that formed about 7800 years ago when the summit collapsed. Associated massive debris avalanches and lahars traveled as far as the W flank of Kilimanjaro volcano. Parasitic cones and lava domes are located on all sides; a maar field is present on the lower N flank. The historically active Ash Cone forms a prominent symmetrical cone inside the breached caldera. A second vent between it and the caldera headwall has fed lava flows that cover much of the caldera floor. Cattermole P, 1982. Meru - A rift valley giant. Volcano News, 11: 1-3. Wilkinson P, Mitchell J G, Cattermole P J, Downie C, 1986. Volcanic chronology of the Meru-Kilimanjaro region, northern Tanzania. J Geol Soc London, 143: 601-605. There is no Deformation History data available for Meru. There is no Emissions History data available for Meru. 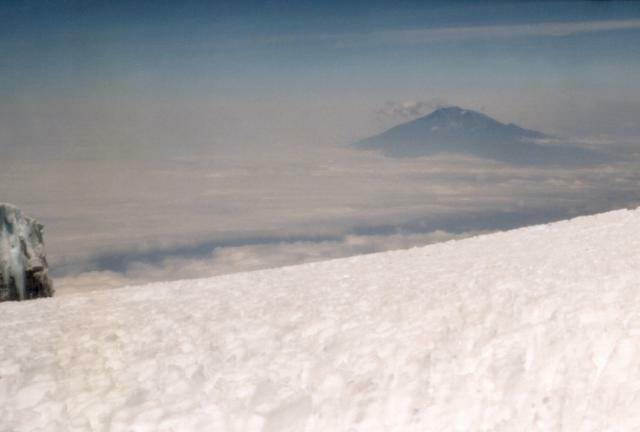 Meru volcano (upper right), Africa's fourth highest mountain, is seen from the ice-covered summit plateau of neighboring Kilimanjaro volcano. The 4565-m-high Meru stratovolcano is cut by a 5-km-wide breached caldera on the east side that formed about 7800 years ago when the summit of the volcano collapsed. A massive debris avalanche and lahar traveled to the east as far as the western flank of Kilimanjaro volcano. Photo by Tom Jorstad, 1991 (Smithsonian Institution). There are no samples for Meru in the Smithsonian's NMNH Department of Mineral Sciences Rock and Ore collection. Large Eruptions of Meru Information about large Quaternary eruptions (VEI >= 4) is cataloged in the Large Magnitude Explosive Volcanic Eruptions (LaMEVE) database of the Volcano Global Risk Identification and Analysis Project (VOGRIPA).